Is it important to reload accurate rifle ammunition? What do you think? My answer is yes! Because this makes difference with the accurate shooting and hunting the target perfectly on the spot. It is your reloaded accuracy. If it ends with perfection with great accuracy it will lead you to good finishing. 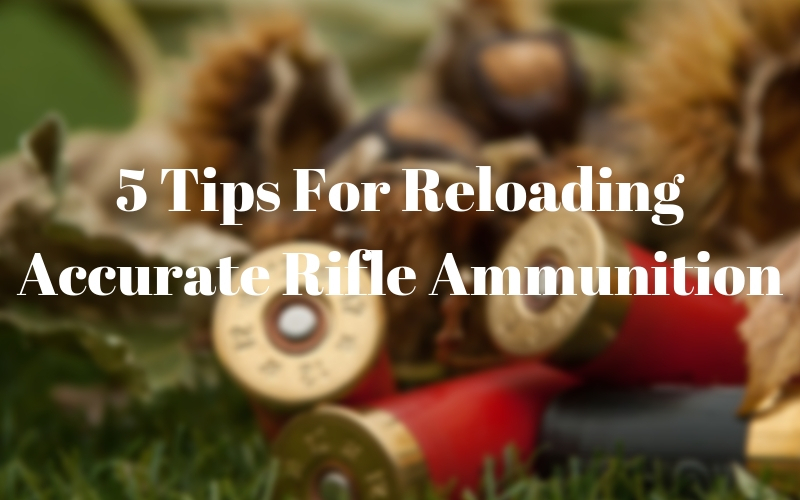 So, here I have added the 5 most important tips about reloading accurate rifle ammunition. Military brass is known for good quality materials and also ideal for the reloaders. But yes, if you use unused brass than it will cost high than the used one. The used one is not expensive. The standard level of bulk brass is higher than military brass which is known as once-fired. Whatever bulk brass is good enough and needless work to make it perfect than military brass. And hence for that, the price is also higher than the military brass. Consistent primer pockets save prep time than military brass. Premium brass cost more but it is the best one. It is made of high-quality alloy. You can use the same case for several periods by spending up front. But whatever you choose for the brass type you must weigh in the balance. This will help you to ensure accuracy. I would suggest you weigh after prepping. It is better for high accuracy application. Even if you use primary brass, you should weigh before using to sort out. If you are ready to load consistent and precise rounds than this shaping procedure is must to do. Whatever you will do here concentrate, will pay later. If your case is used for several times, you must pay heed more carefully to the body of the case to find out the wrinkles, split in the necks, round mouths and other things. If the bullet’s flush hole is made punched than there may stay metals but for the drilled hole it doesn’t happen at all. For high accuracy target, you will need to care about these little burs. For removing that burs you have to deburr. After one fire, you must do deburr. Because normally after the fire, burs grow in the case. The deburring tool looks like the drill bit. This tool can set into the case. Set the tool and deburr it carefully and smoothly. No matter how much costly tool you are using, you must deburr always lightly. If you could see a shiny ring inside the hole after deburring by holding it within a bright light source, you would have been done the deburring. Do you know that there is a lot of information for every kind of rifle in the web for the cartridge? You can easily access that information. It is better to load for the first time to reload the rifle with the proven loads. There must be standard loads for each and every rifle. You should know that and use that specific load. It is better to crosscheck the data. Are you thinking that how to do this analysis? Don’t worry this is not so hard! Actually, it is easy to do. There is information in the reloading manuals and also the data for the rifle in the powder manufacturers. There are also some individuals who upload data about the particular rifle. You can cross check there and find out the actual load. One of the most important fact on which the accurate rifle ammunition depends is optimizing the depth of bullet seating. It will determine how much depth the bullet will take in the case. It varies from rifle to rifle. That’s why measurement is necessary. With the tool at first, you will determine the maximum overall length. With the latest kind of tool, you can fit the depth by custom. To find out the perfect depth, you have to start with the depth that touches the rifling. Comparator and comparator with inserts are my favorite tools to find out the maximum possible accuracy of seating depth. You can also use seating dies to maximize the accuracy. These dies are best for fresh entry level. Either rifle or pistol you can use for both of them. You can find both chamber and threaded style dies. In the threaded system, use with progressive presses but in the chamber with arbor presses. Whatever, it is true that this is the most crucial step in making the reloading accurate. It will be wise to do some experiment over the published loads’ data. For the accurate rifle ambulation, it is important to do the experiment. As the bullet weighs can be experimented. You can also do experiment with the seating depth of the bullet along with different dies, powder charge, bullet profile etc. But you can set with your own wish. You have to set a primary variable. Go with this variable and pick different results. Overall with the whole result, you can compare the result and choose the best one. Therefore, now you have known the 5 most important tips about accurate rifle ammunition. These 5 tips are the most common ones that people need to know. And however, I have listed in this article only the most important suggestions. If I say something more, I should say about trimming. It is also an important one to resize the die. Best of luck with your hunting!